​I’ve been creating photo essays for four years. I’m always looking for inspiring stories that my readers and I can grow from. A core area of interest is social justice and within that I have a special focus on homelessness. Going into 2018 I wanted to do something new. In thinking about my work over these years I realized that I’ve met some very amazing people who go above and beyond to make a difference for others. Many forgo more lucrative jobs in order to follow their passion for doing good. Most often their stories go untold, but I want to change that for a group of “Amazing People Who Make A Difference”. This first story is dedicated to Emily Taylor, Director of One Step Away- Philadelphia’s street newspaper. My thanks to Emily and to those that follow for allowing me to tell their stories- these are not people who seek adulation, rather they avoid it. But their example can be an inspiration and motivation for others. I have a personal stake in this story because I’ve been doing volunteer photography and writing stories for One Step Away for three years. I have such admiration for Emily and for the vendors who go out every day to sell the newspaper. ​In the fall of 2014 I began to investigate homelessness in Philadelphia. Having pretended that homelessness didn’t exist for so many years, I hoped that my camera would bring me closer to this disgrace in society. It didn’t take long before I encountered "One Step Away", Philadelphia’s monthly street newspaper that advocates for people experiencing homelessness and joblessness. Street newspapers are a phenomenon in many cities around the world. They’re sold by “vendors”, many who have experienced homelessness, and some who still do. One Step Away is filled with articles about homelessness and other topics related to social justice. One Step Away also gives voice to the vendors whose articles and poetry are a staple in every issue. Vendors are readily apparent on Philadelphia streets wearing their yellow vests and name tags. They purchase the newspaper for $0.25 and distribute it for $1.00- many people give more. It’s remarkable that diligent vendors, who work in all weather and face the inevitable feeling of being invisible to the public, can earn enough to cover, or at least contribute to, the cost of food and housing. ​Vendor Joseph projects a warm smile to his customers; the cover story about the Women’s March on Washington is an example of social justice topics covered by One Step Away. ​On its face, this would seem to be straight forward: One Step Away prints a newspaper and vendors sell to the public. But it’s far from straight forward. One Step Away’s success and very survival sit on a razor’s edge, delicately balanced by the guiding hand of its director, 30 year old Emily Taylor. This photo essay is a tribute to Emily who has made One Step Away a force for good in Philadelphia. ​One Step Away is a program of Resources for Human Development (RHD.org), a large Philadelphia based organization that provides a wide range of human services to the most vulnerable members in society. RHD’s new street newspaper got off to a great start- but the question was how to sustain it. Running One Step Away out of the Marketing and Communications Department was not a long term solution- the newspaper needed a dedicated owner. 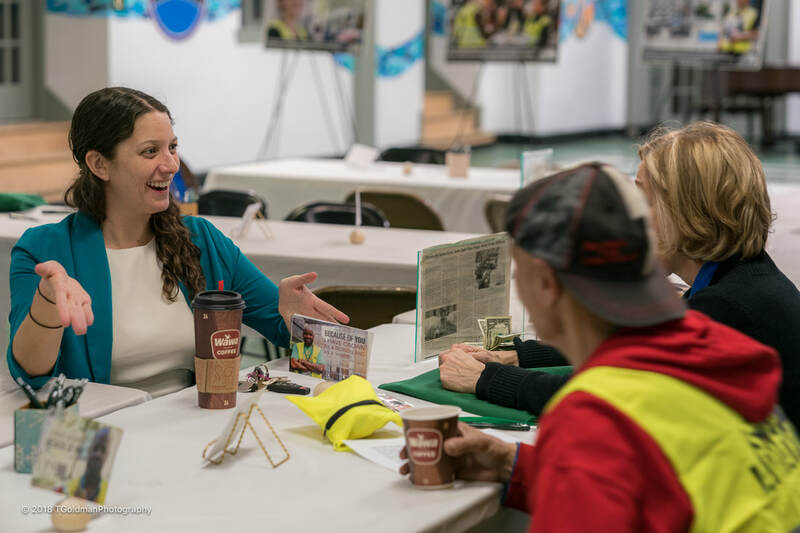 Two major advancements were made under Emily’s leadership: she changed the vendor model from people in RHD shelters, to a vendor corps of people from the streets of Philadelphia- anyone could sign up to be a One Step Away vendor. And she moved One Step Away to the heart of Philadelphia at the Arch Street United Methodist Church (one block North of City Hall). Emily’s leadership had taken hold and One Step Away was on its way to becoming a lifeline for so many people who would otherwise slip through the cracks. ​A homeless person on an early Philadelphia morning. The street sign “END ONE WAY” is emblematic of One Step Away: there is more than one way, a better way, for people who want to rebuild their lives while avoiding the shelter system which can be so demeaning. What was One Step Away like when you took over the program: “When I got the job there were 5-10 vendors selling a few thousand papers a month; the program was running a $25,000 deficit- that’s what I inherited.” Emily’s drive to build One Step Away soon took hold and the program grew: “Today we have about 60 vendors selling 12000-15000 papers each month.”… Most importantly, 60 people are earning money to help them put a roof overhead and food on the table. 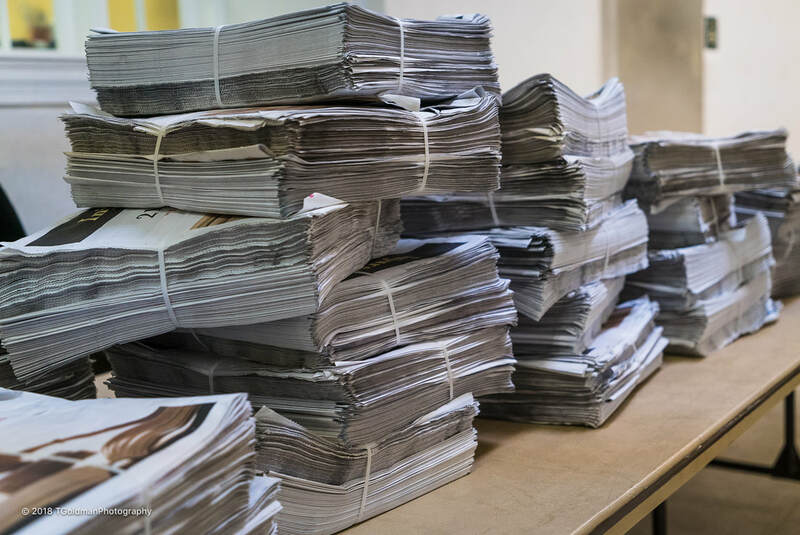 ​Mounds of One Step Away newspapers ready for vendors to hit the streets of Philadelphia. Is the ultimate goal is to have vendors move up and then out to their own careers: “It’s based on the vendor and their lives; for example vendor Jeff who is 65 has decided this is what he wants to do and with his skills he can grow within One Step Away; but some vendors we see are in their 20’s- there should be more for them; we want to meet vendors where they are… I think people need opportunities and if they aren’t presented with opportunities, things won’t change; they need advocates and that’s the biggest thing we provide”. ​Vendor Jeff uses his leadership skills to train a group of vendors at the Arch Street United Methodist Church- home to One Step Away… He is also an accomplished photographer. You’re so focused on the vendors and helping them advance in their lives, but what about you- what are your long term goals and is One Step Away part of that future: “I love the idea of social enterprises, businesses that generate revenue and help people at the same time; I would love to build One Step Away into having numerous social enterprises so that the newspaper is just one avenue.” Emily has considered the idea of coffee carts where vendors would sell coffee and the newspaper- this would build skills and entrepreneurship along with generating additional revenue for One Step Away… At this point in her life Emily sees a future building the grand vision of One Step Away. ​With a show of emotion: “These vendors ARE people- they’re community members who just fell on hard times; it’s about helping people back on their feet and giving that stepping stone; they’re talented, smart, strong people with the will to persist and continue on- they just need to know someone cares!”… Emily has clearly defined what it means to be an amazing person who makes a difference. ​In three years of working with One Step Away, I’ve seen the immense impact on vendors’ lives. And I’ve seen the unrelenting work that Emily takes on her shoulders to run One Step Away. Her task is even more daunting because there's more to the story of One Step Away- it relies completely on community support. ​Jim Piasecki, Ph.D. (left, with his vendor partner Michael at the Big Sell Off) is the RHD Regional Director that oversees One Step Away. He spoke about Emily’s contributions to One Step Away and the enormous challenges she faces. Vendors Jeff and Brian are perfect examples of how vendors connect with the public. ​Vendor Joe: “Thank you so much Emily, not only for me but for all the other homeless people… Once you’re homeless, people get beat up and we never get back; if we didn’t have One Step Away to help, a lot of us would still be out there- and that’s the truth. ​The Presenting Story of One Step Away is that it is a street newspaper which offers people who are down on their luck an opportunity to make some money and to educate the public at the same time. This is the story most people know about One Step Away. The Real Story of One Step Away is that it is a program to enhance the quality of life (living conditions, life and work skills, self expression, upward mobility, self esteem) of people who have slipped through the cracks, and at the same time it connects and facilitates community interactions within Philadelphia. It’s also a program that, like its vendors, has very precarious financial resources. This is the story known only to people who get very close to the program. The Story Within The Story of One Step Away is Emily Taylor whose leadership, passion and dedication have made One Step Away what it is today- a safe place for people to rebuild their lives. This is the story of an amazing person which, until now, has been largely unknown to the public. One Step Away’s greatest benefit is that it very likely saves lives. On the first day of winter, Philadelphia holds the annual Homeless Memorial Day which remembers homeless people who were lost during the year. In 2015 there were 164 names; in 2016 there were 200 names; in 2017 there were 300 names- a very grim inflation rate. If One Step Away hadn’t existed for the past eight years, how many of the vendors would have remained homeless- how many might have died? There’s no way to know for sure. But we do know for sure is that One Step Away’s 60 vendors depend on this program. ​Emily exemplifies an additional attribute of truly amazing people: she doesn’t realize that she’s amazing- but everyone else does. To learn more, donate, or support One Step Away, please visit osaphilly.org... And if you're in the Philadelphia area, a great way to help would be to attend One Step Away's annual fundraiser, the Champions Celebration, held this year on May 10, 2018 at the Pyramid Club. It's a fun evening with a purpose: learning about the people who are working to end homelessness and supporting One Step Away- I'll be there to take your picture! ​It can seem so impersonal- we use words like: homeless, street people, panhandlers, addicts, but it’s about real people who experience so many life struggles: going without food, clothes, safe and secure housing, healthcare. One Step Away is a lifeline. Skim through the following vendor images- each one is a human being who has been lifted up by One Step Away. ​Vendors Jen and Skip, proud parents of Christian Michael. ​Vendor Mack: They come in all shapes and sizes, colors, men and women, old and young- so many people in society are just One Step Away.